Pat's Scraps: Die Cuttin' Divas Christmas in July Challenge! This week's challenge at Die Cuttin' Divas is Christmas in July! It was fun making a Christmas card at this time of the year. This is the first one I've made for this year, AND the first one that I've ever made this early in the year. A few new firsts for me! Cut trees from Winter Frolic cart; one set is flipped. Added gold gems at the top of each tree. Sentiment on the front is from Bug Bites Mistletoe stamp set. And speaking of that, Bug Bites is this week's sponsor. And the prize is the Mistletoe stamp set! So come and join us for this fun challenge. Make a card, layout, or altered project with a Christmas theme. 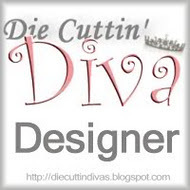 Use a die cut in your project and link your post back to Die Cuttin' Divas. We look forward to seeing your Christmas projects!! Great card! I love the embossing on the trees and that plaid paper looks great in the background. Love your dancing Christmas Trees. Thanks for playing along with us at Go Fish! Such a fun happy Christmas cards, love the trees!! This card is so adorable! I love the sentiment too! So cute and love the sentiment!! Thanks so much for playing at the Go Fish Challenge! Very cute. Turned out great! Love both sentiments...where is the inside one from? Great card Pat. This is one of my favorite Chhristmas tree images. I love the colors you used. Love, love, love this card! Happy little trees! This is a fun quick and simple card that can de3finitely be used time and time again for anyone. Great job. Thanks for playing along wit the CIP theme of Christmas in July! That's adorable!! I love those tree's! Great card Pat!! Congrats on winning this challenge over at Go Fish Blog!! !